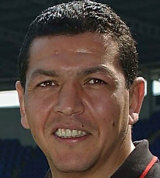 Abdelatif Benazzi won 78 caps and scored nine tries for France as a lock and back-row player. Benazzi began his international career with his native Morocco but was swiftly spotted by the French selectors and made his debut for Les Blues against Australia in 1990. He played in three World Cups for France and was a member of the France squad that reached the final of the 1999 World Cup, where they lost to Australia. Benazzi captained France during the 1997 Five Nations and twice won the Grand Slam before making his final international appearance against England in April 2001. At club level he represented Agen and Saracens.